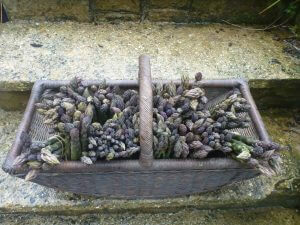 Yes, it’s finally arrived and now officially Asparagus Time at Bothen Hill. This year the harvest has been frustratingly slow due to the recent night frosts experienced which have created a huge differential between daytime and nightime tempreatures. However, finally, it is getting warmer and the spears are starting to appear in greater quantity. We are now picking daily and our box and farm gate customers have been able to buy for the last couple of weeks. We’ve also been at Bridport Street Market on a Saturday morning, albeit with limited stock. With the main of the crop now coming on stream this is also available at Modbury Farm Shop in Burton and will soon be travelling further afield. In the meantime we have also been busy planting, all our main crop potatoes have been in for just over a week now and we will hopefully be removing the protection from the early potatoes later this week. The salad crops are coming along well in the tunnel, harvesting lettuce this week and the salad leaves are cropping well. Outside we are starting to see new growth on a daily basis, the bees have been busy pollinating the broad beans which are growing well. Lines of carrots, beetroot, spinach and kale are starting to appear and the peas, both traditional and sugar snap are starting to grow well. We have been harvesting good quantities of rhubarb on a weekly basis and both the purpose and white sprouting broccoli have finally come into their own with the sunshine. As long as this continues new season veg should not be too far away.